Looking for this? The blog has moved to Tikkido.com! Find the full post over there and join us for all the fun new content. LOVE the magnet idea. These are beautiful! Thanks for sharing! I love these!!!! Great idea! I LOVE how sparkly your stand is...I think this is the prettiest cupcake/cookie stand I've seen-fabulous! Great idea, thank you for sharing! Thanks for the tips today! I looked up the Lorann Oil flavorings and saw that amazon sells them. What flavors are good ones? I rarely comment on blogs and merely bumped into this post, but I just had to tell you I absolutely love this!! It's a fantastic idea!! That is incredibly creative & BEAUTIFUL!! Saw it on Pinterest & just had to comment, plus I'm your newest follower, too. p.s. My baby sis lives in Gilbert, AZ!! I came across your post on Pinterest! I absolutely love these!! I have been looking for inspiration to save on our vow renewal since we had a JOP and I *refuse* to believe that the more I pay, the better my celebration!! The cake situation was difficult until I came across this! May I ask, how much did it cost to do this? I don't remember the exact cost at this point, but I know I leveraged Michael's and Joann's 40% off coupons, and I believe the entire project was about $60 for the set of four plates with interchangeable bases. I already had the E6000 glue and fimo on hand, though, so I didn't have to buy those for this project. Just doing the simple glue method would bring down the cost, too. Doing the second version would also help on storing the project. I'm doing the second version. How clever!! wow this is super pretty:D what a great Idea! thanks for sharing. Adding this to my very long to-do list. Where did you find your candlesticks, so pretty! Beautiful!!! Thank you so much for sharing!! Great idea, certainly going to make me one of these. Thanks! We've moved the blog over to tikkido.com, so come join us over there for all the fun tutorials and parties. did you put magnets on the bottom of the candle holders? Or are they just resting on top of the mirrors? I'm worried they'll fall off if I don't secure them. Nope, no magnets on the bottom of the candlesticks. While you do have to take a bit of care, it's just like any other set of stacking cake stands. Oh--and please join us over at http://tikkido.com ! The blog has moved over there, so that's where all the fun new content is. do you put magnets inside the candlesticks, then glue the dough over that & then glue a magnet on top of the dough..just a little confused on that part....Love this idea. Dough first, then magnets on top. The dough lifts the magent up so that it can physically connect with the magnet on the underside of the mirror. Amazing idea! I saw it on Pinterest but had to come take a look and pin it for myself. This is gorgeous...... if i do the easy version will it be sturdy enough to hold cupcakes without having to worry about it easily falling over or would it be wise to just glue the entire thing together. I noticed in the instructions it says to glue the candlestick to the bottom of the mirror but not the top of the mirror. It will be plenty sturdy if you just glue the candlestick to the bottom of the mirror and stack the cake plates. That's how tiered, stacking cake plates typically work. Keeping them separate makes them *much* more versatile. Just need one? No problem! Need the whole set? Can do! The new content has moved over to our new website/blog at http://tikkido.com. Join us over there for all the fun new content! I am new to your blog and I love the project! I am an E6000 lover! I was just wondering though is it safe to use the E6000 on projects that you are going to use for food? The instructions on the package say not to. I have always wondered but never tried it myself. I made a jewelry stand just like this only with plates. I think since the E6000 is on the underside, not on the surface that food touches, it's fine. Interesting question, though! The blog has moved over to http://tikkido.com , so join us over there for all the fun new content! Too cute for words! 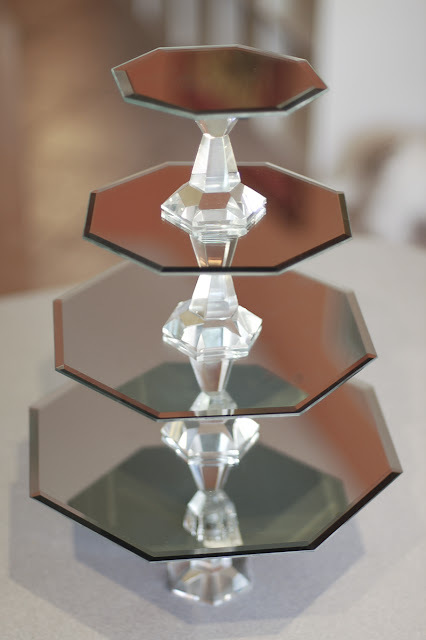 I love candle sticks and mirrors now I have more I can do with them. Awesome creation ! I am thinking about some cake stands design for my online store & i have got here exceptional idea.Thanks a lot ! Pottery Barn Kids Star Wars Event Tomorrow!